S. S. Kresge worked hard, spent his money only when necessary, and saved it wisely. This penny-pinching attitude, which began early in life, led him to become an extremely successful businessman and a generous multimillionaire. It was also the attitude shared by millions of cost-conscious customers who flocked to the five-and-dime stores and Kmart discount stores that were launched by the man himself. "I think I was successful because I saved and because I heeded good advice … I worked—and I didn't work only eight hours a day, but sometimes 18 hours. When one starts at the bottom and learns to scrape, then everything becomes easy." Sebastian Spering Kresge was born on July 31, 1867, in Bald Mount, Pennsylvania. His parents, Sebastian and Catherine Kunkle Kresge, were farmers of Swiss ancestry. Sebastian Jr. was given farm chores to do as early as age five. After attending schools in rural areas, he went to Fairview Academy in Brodheadsville, Pennsylvania. Kresge was so anxious to continue his schooling, he made a deal with his father: if his father paid his way through business college, Kresge agreed to give all of his earnings to his father until he turned twenty-one. His father agreed, and Kresge attended Eastman Business College in Poughkeepsie, New York. The earnings Kresge received came from a variety of odd jobs. He was a deliveryman and clerk in a Scranton, Pennsylvania, grocery store and a teacher in Gower's School in Monroe County, Pennsylvania. He made $22 a month as a teacher. He also worked as a beekeeper, but he kept the money he made from that job for himself. According to his 1966 New York Times obituary, Kresge once said, "My bees … always reminded me that hard work, thrift, sobriety and an earnest struggle to live an upright Christian life are the first rungs of the ladder of success." In 1889, Kresge's business savvy began to take shape. He was employed as a bookkeeper at a hardware store in Scranton and noticed that when the store allowed customers to pay with credit, not cash, they bought more items than they really needed. The store, in turn, had to delay payment of some of its bills because of this policy. Later, Kresge accepted only cash payments in his stores. Three years later, Kresge was given his big break. His employer was impressed that instead of sitting around doing nothing during slow business, Kresge would work at odd jobs. For example, Kresge was known to clean, polish, and sell old stoves. Because he showed an ability to work hard, Kresge was promoted to traveling salesman for W. B. Bertels Sons & Company. It was his responsibility to sell hardware and tinware to the New England and North Central states. One of his customers was Frank Woolworth (1852-1919), who had opened the first chain of dime stores in 1875. Kresge sold Woolworth enough products for each of his nineteen stores. The young salesman was impressed with this central ordering practice and equally pleased because it was a cash transaction. After eight years working as a salesman, Kresge had saved $8,000. In 1897, he invested his entire savings in the opening of two five-and-dime stores in Detroit, Michigan, and Memphis, Tennessee, with his friend, businessman John McCrory (1860-1943). By 1907, Kresge had bought out McCrory and was on his own. He incorporated the S.S. Kresge Company and became president and chairman of the board. 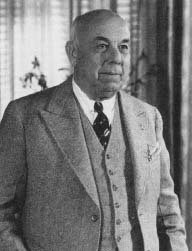 Kresge was president of his company until 1925, and was known as a good manager. Although he was very careful with his own money, he was generous with his employees. Kresge was known to frequently visit his red front stores and engage in conversation with clerks and managers. From the very beginning, he offered paid sick-leave, paid holidays, profit-sharing, and pensions for employees who retired. Although Kresge stepped down as president he stayed involved with the company, serving as chairman of the board. He kept that position until a few months before his death in 1966. Kresge was also involved with other businesses and investments. He was president of Kresge Realty Company and owned department stores, including The Fair in Chicago, Illinois; Palais Royale in Washington, D.C.; Stern Brothers in New York City; and Kresge-Newark and Steinbach-Kresge stores in New Jersey. By the end of the 1920s, he was worth more than $200 million and owned stock valued at about $30 million. Raised a strict Methodist with the belief that alcohol, tobacco, and gambling were unnecessary evils, Kresge also thought it was his Christian duty to share his wealth. In 1924, to commemorate the one hundredth anniversary of his company, he contributed $1.3 million to set up the Kresge Foundation "to promote the well-being of mankind." Before he died, Kresge donated approximately $175 million to the foundation. Throughout his lifetime, S. S. Kresge was known as thrifty and frugal. He bragged that he never spent more than thirty cents on lunch, wore inexpensive, plain suits until they practically fell apart, and lined his shoes with paper after the soles wore out. At the age of fifty-eight, Kresge was coaxed into taking up golf, but he soon quit because he lost too many balls and decided he could not afford to continually replace them. In 1897, Kresge married Anna E. Harvey. This first of three marriages ended in divorce in 1924. Later that year, he married Doris Mercer. Their divorce came four years later, and in October 1928, he wed the woman he stayed with until his death, Clara Swaine. The chief complaint from each of his wives was that he was too stingy with his money. Their divorce settlements, however, were quite generous: Kresge's first wife (and five children) received $10 million and his second wife received $3 million. The Kresge Foundation, still in existence but no longer affiliated with the Kmart Corporation, has provided gifts totaling over $1.5 billion since its inception to such organizations as the Methodist Children's Home in Detroit, the YMCA, the Anti-Saloon League, and many universities and hospitals. In 1999, it was one of the twenty largest foundations in the United States. Kresge's grandson, Bruce Kresge, was chairman of the board and his great-granddaughter, Deborah McDowell, was also a board member. At the age of eighty-five, in one of his more noteworthy speeches, Kresge chose his words as wisely and frugally as he spent his money. The occasion was the dedication of Harvard University's Kresge Hall in 1953, and the speech consisted of only six words: "I never made a dime talking." Thirteen years later, in 1966, S. S. Kresge died at his home in East Stroudsburg, Pennsylvania, at the ripe old age of ninety-nine. Plunkett-Powell, Karen. Remembering Woolworth's: A Nostalgic History of the World's Most Famous Five-and-Dime. New York: St. Martin's Press, 1999. Hays, Constance L. "Maybe It Was the Blue Light's Hypnotic Effect." The New York Times (May 30, 2002): p. 5. "'It Doesn't Get Any Better Than This.'" Business Week (September 4, 2000): p. 84. "A Kmart Special: Better Service." Business Week (September 4, 2000): p. 80. "Kmart's Last Chance." Business Week (March 11, 2002): p. 68. Longo, Don. "How Walmart KO'd Kmart." Retail Merchandiser (March, 2002): p. 5. Naughton, Keith. "Crisis at Kmart." Newsweek (January 28, 2002): p. 38. Perman, Stacy. "Attention K Martha Shoppers: Martha Stewart can decorate anything, and she rules a $150 million empire." Time (October 6, 1997): p. 54. "S.S. Kresge of Store Chain Dies at 99." New York Times (October 19,1966): p. 38. Taub, Stephen. "Can Kmart Come Back Again?" Financial World (March 31, 1983): p. 50. Kmart Corporation. [On-line] http://www.kmartcorp.com (accessed on August 15, 2002). The Kresge Foundation. [On-line] http://www.kresge.org (accessed on August 15, 2002). I don't believe that the old man was a Christian. He ran around on my great aunt often using a sydonym when he checked into hotels in the Detroit with his women. My Aunt put up with alot from S.S. And she did not as your acticle states complain that he was too frugal. He was very, very generous with family. He helped my Grandmother Harriet (Anna's sister) after Harriet's husband died and left her with five children (my father was one of those five children. S.S. stepped in and was surrogate father to my Dad (Harvey Kresge Ebert) and put him through the University of Michigan where my dad graduated with a degree in Civil Engineering. My Dad eventually went to work for the "OLD MAN" (our families affectionate name for Sebastian. My Dad retired in 1971 from the Company. (The family name for the corporate in detroit,. Martha Ebert Fazzini (grand niece by marriage to the OLD Man.